Greetings club members and fellow bicyclists. Our summers seem to be getting ruined by the larger fires in recent years, creating a smoky environment for us. This makes for very unhealthy air. As a result, our riding has been extremely curtailed the past few months. It was necessary for us to reschedule July’s Tour de Lakes due to the bad air quality. The only real escape from it has been to go to the Central Coast to ride. We had always done the Tour de Lakes in July as a ride to escape the Valley heat, but if the fire & smoke trend continues, we will be forced to not only escape the heat but the smoke as well. We may have to consider doing more rides on the coast during the summer months in years to come. and we had a number of great comments on the food and SAG offered with the ride. The Bob Brooks memorial ride coincided with the TDL, on August 18th, as it was one of Bob’s favorite rides and it was a fitting memorial ride to honor his legacy as a long time FCC member, national racing and international bike racing champion. These are just the paid event rides. There will be plenty of Club rides as well, such as the Herrington Sacramento American River ride in November, and the Central California Off-Road Cyclist’s club’s (CCORC) Homegrown Cyclocross series of three events starting in October. Keep an eye on that Ride Schedule. I hate to sound like a broken record, but as a Cycling Club that advocates for and supports safe bicycling, I must remind everyone that we must set the example for others to follow. I know none of us are perfect, but we must always be vigilant and aware of our surroundings. We must respect ALL users of the roadways if we ourselves want to be respected. We complain all the time about motorists not giving us our 3 feet, “coaling” or “dieseling” us, not yielding to us at various times, etc. Drivers in turn complain about cyclists running stop signs and red lights, riding two or more abreast blocking their roadway, and one of the most dangerous, stopping in and blocking the roadway while we rest or complain about motorists. Not all cyclists, of course, are members of the Fresno Cycling Club. But, because the Fresno Cycling Club is the most visible and well known, we are the ones that get blamed for the missteps made by all cyclists. I have even had members confide to me that they don’t wear the Club jersey as they don’t want to be beholden to follow the laws. Really!!! Is it really that hard to follow the laws? If we want motorists to follow the laws (even though doing so may inconvenience them, ie., following slow bicyclists who are taking the lane when the lane is too narrow to share), then we can endure the inconvenience of taking our turn at a stop sign or stopping for a red light. Gaining the respect of motorists will not happen overnight but when you think that most motorists do respect us and it’s a small minority of motorists that have a problem with us, it is in our best interest to try. One of the main things we like to do is promote club rides. It is so cool when a large group of 30 or so riders get together on a ride. One of our standards is that of "no rider left behind" on a Club sponsored ride. We indoctrinate our ride leaders to make sure that when leading a ride that they finish the ride with as many riders as started. Of course there are exceptions, but if a rider drops out of a ride for whatever reason it is important that the ride leader at least be informed by the rider or another rider of the circumstances. Lately, there has been some discussion about relatively large groups and the unsafe conditions they can pose, especially when the group tries to stay in one or two large groups, either pace-line riding or in a peloton (2-4 abreast). There is a feature of groups called the “Group Mentality,” which suggests that when riders form a large group, their dynamics change. They feel more empowered, less vulnerable and more willing to take chances that individuals wouldn’t take. Larger groups also tend to be more intimidating to some motorists, making them nervous around cyclists. Thus, they become irritated with us. I think it is time we tell our ride leaders to encourage the riders to form smaller sub-groups of 5 to 10 when riding together on a large club ride. Often, this occurs naturally, with the various riding abilities, but it is much safer for riders to be in smaller manageable groups and this should be encouraged. I hope everyone continues to have great rides, be safe and support safe and legal cycling. Greetings fellow cyclists and club members! A few of you (2 or 3) may have noticed there wasn’t a Prez Sez last month. That was a first for me, as I hadn’t missed a month in the five-and-a-half years that I have served as President of this great Club. The busyness of directing the Climb to Kaiser took its toll on my brain. The monthly message from the president has been a staple of the Rough Draft for as long as it has been in existence. In the past (pre-social media), it was the only means of reaching out to Club membership to keep everyone abreast of Club business. In the past year, the Board of Directors made the decision to change the format of the monthly Rough Draft from a printed and email format to a digital and email format. With the advent of Facebook and a more robust website (with a “live” ride calendar), it had become apparent that very few members were utilizing the email version of the Rough Draft, and even fewer were utilizing the printed version. The printed version used to be the only means for many to find out what was happening with the Club and it was where our monthly calendar of rides was found. Now that we have a live calendar on the website (“live” meaning we can add club ride updates even spur of the moment), the printed version was not as necessary and therefore was dropped. The 42nd Climb to Kaiser is history. No records were challenged this year, but as always, the C2K proved this year why it such a special event, challenging the riders with elevation and heat. Although the C2K is not an official “race” due to our insurance coverage that doesn’t cover race events, it has become a race against the clock (a Time Trial of sorts) and there are always individuals who want to challenge the fastest time. The current record for the C2K overall is a flat 8 hours. This year the “Vegan Cyclist,” local racer Tyler Pearce, wanted to challenge the record, and he even arranged to have it filmed as a documentary. Although he did an amazing ride, he didn’t come close to beating the record of 8 hours. His time was 8 hours 42 minutes. Tyler’s video was picked up by the Global Cycling Network and C2K received worldwide coverage on their show along with the Tour de France. The filming of Tyler’s C2K ride did result in some C2K drama when some of our volunteers had observed what they felt to be Tyler receiving personal SAG support on the part of his filming crew vehicle. What the volunteers hadn’t been told by the C2K director (me, my bad) is that Tyler’s ride was being filmed and that the chase vehicle had been authorized to follow him. It is nice to know that our volunteers are aware of the C2K rules regarding no personal SAG. This rule is in place as a result in part of the Forest Service Permit not allowing additional vehicles to follow riders in critical areas on Kaiser Road. One thing that became clear is that the C2K rules have become more important to the top riders that want to challenge the existing completion time. Of course, over the years the routes have varied, so the finish time for one route may not apply to another route. That was the case of this year’s C2K, in which a change to the start/finish venue impacted overall times. We may need to review the C2K rider rules, which may need a bit more clarification regarding what constitutes “personal SAG.” Along the same lines, there seems to be a problem with “ride crashers” joining the ride at various locations throughout the course to support riders; it seems there is no standing rule that applies to this and maybe there should be. Nancy Dooley has shared some of her photos of this year's Climb to Kaiser. Along with her other volunteer duties, Nancy managed to catch some nice shots of the participants in action. You can check out the photos from a link on the Fresno Cycling Club website, or directly from this link: Nancy's Photos. 5) it’s an event that you have to train for, and not that many folks are training these days to do tough rides. A bright spot was that this year the C2K was rated by Granfondo.com as one of the top ten most beautiful and challenging rides in America. It still remains one of the best supported rides, thanks to all of our awesome volunteers who help put the event on each and every year. Keep up the great work Fresno Cycling Club. Long time Club member and local Cycling Legend Bob Brooks passed in his sleep on July 23, 2018. He was seen on the Saturday before, doing one of his favorite rides from Shaver Lake to Courtwright. This picture was taken in July 2011 during the annual TDL ride. Bob was a six-time US National Time Trial Champion and had also competed and won in Russia. There is so much to say about Bob and all of his cycling accomplishments, but I would prefer that someone who knew him well could include his story in the next issue of the Rough Draft. For the first time in 24 years, the Grizzly Century Ride will be hosted by the Fresno Cycling Club. This event will take place on October 6th, 2018. Until recently it has been the efforts of Mike Nolan and the Community of North Fork who have been responsible for hosting this fabulous ride. This charity event has been the backbone fund-raiser of the Sierra Vista Scenic Byway and North Fork Community for nearly 25 years. The majority of the proceeds have been invested in maintaining and improving the amenities of the Sierra Vista Scenic Byway. It is hoped that with the support and coordination provided by the Fresno Cycling Club, this tradition will be able to continue. I am reaching out to all our members and supporters of the Fresno Cycling Club and Cycling Community to support this great worthwhile Bicycling Event. You can register for one of the 4 rides of the event at: https://fresnocycling.com/event-2846401 or volunteer to help out by contacting me atpresident@fresnocycling.com. The Fresno Cycling Club may not be noted for putting on HUGE rides (such as a Cal Classic or Levi Granfondo), but we sure do put on some well-supported ones. One that has been around for a number of years is the upcoming Bass Lake Powerhouse Double Century (or, Bass Lake DC, or BLDC for short). It will be held on October 13, 2018. The BLDC Ride Director Angelo Quitorio and his band of FACT volunteers will once again put on this great Double Century event. The BLDC is one of the many qualifying Double Centuries that riders vying for the coveted Double Century Triple Crown or 1000 Mile jerseys will ride in. This year’s route will be the same revised route as last year. The majority of comments by riders last year was that they loved the new route. This revised route allows the riders to ride up to the Bass Lake area in mostly daylight hours and those that ride in later darkness enjoy a more rider-friendly route with little traffic to deal with. This year, riders will be treated to finishers medals upon completion of the ride. Bass Lake DC Kits are also available for purchase by contacting the ride director Angelo Quitorio. Go to http://www.basslakedouble.com to get more information and register for the ride. Greetings fellow club members and bicycle enthusiasts. Climb to Kaiser - Important Update!! After much deliberation and gut wrenching, the decision has been made to change the date of the Climb to Kaiser. Due to circumstances beyond our control we are changing the date of this year's ride to July 7th, 2018. For some of you this comes as great news as it gives you another week to train. Unfortunately for others of you it may be disappointing if this date doesn't work for you. Hopefully it doesn't affect anyone. To hold our event, we must secure an Encroachment Permit from Cal Trans which has to have approval from not only Cal Trans, but CHP and the Sheriffs Office in order to hold our event. Due to the Shaver Lake Visitor Bureau's annual Fireworks Display being on June 30th, the agencies are not willing to give us approval due to all the anticipated traffic and safety concerns. Unfortunately we were not made aware of this event conflict until a week or so ago. In an effort to provide our riders with the safest possible event, I had to make the decision to move our event to Saturday July 7th, 2018. This will allow for easy approval of our Encroachment permit by the various Agencies. This change may also result in having to change our start/finish venue from Alta Sierra Middle school to possibly Clovis East High School. I will know by the middle of next week. It is a change that could actually be beneficial as it wouldn't affect the route much. I will keep you informed as necessary. Well, National Bike Month has just ended, but don’t let that stop you from riding! It was a great month of bicycling with FCC, the FCBC (Fresno County Bicycle Coalition), our local bike shops and others hosting many bicycling rides and events. The month started with the annual Mall to Mall ride. FCC, Stevens Bicycles, and Sunnyside Bikes led satellite rides from Fresno and Clovis to meet up at Manchester Center Mall with the rest of the FCBC main group. From there, nearly 100 riders rode to the downtown Mariposa Mall in front of City Hall. Next up was the monthly ART HOP bike ride, then the Annual Kirch Flat Cinco de Mayo ride. This year’s Kirch Flat Century had nearly 300 riders: one of the largest groups for this Club ride. Our FCC ride calendar was also full of daily rides. In addition, there was the FCBC “Ride to Work” day, with aid stations at various locations to encourage bicycling commuters. There was also the Central Valley Million Mile Challenge where there were nearly 500 bicyclists that logged nearly 100,000 miles for the month. Every year it just keeps getting bigger and better with more and more bicyclists getting involved. The purpose of May is Bike Month is not just to get a lot of riding in for the month, but to highlight bicycling as a way to travel, and to get more and more people out riding bicycles all year long. Our big focus this month will be the 42nd Annual Climb to Kaiser, Tollhouse Century and Millerton Metric rides, which had to be rescheduled to July 7th (see above). If you aren’t riding it, please consider working these rides! Go to https://fresnocycling.com/event-2943424. It’s great fun getting to help the riders achieve their goals. This will be the 42nd edition of Climb to Kaiser. Let’s make this another great ride, to solidify the Fresno Cycling Club reputation of putting on great rides. Our club has been doing this for 41 years. It has seen many variations over the years. The “C2K,” as it is affectionately known, even has a book in the works by our Club Historian, Mark Perkins. This ride has been listed as one of the Top 10 Toughest Rides by Bicycling Magazine and just this year it was named Top 10 Best Rides in the Country by ‪Grandfondo.com. It is exciting to follow in the footsteps of all the past ride directors and volunteers who have made the C2K such a great event. I hope we can keep it going for many years to come. It seems the planning of C2K has had many challenges over the years, especially with competing events. We have had the Rumble to The Summit motorcycle rides, the 4X4 Moonlight Madness events, and this year it is the Shaver Lake Fireworks display. All these events generate additional traffic on the Highway 168 leading to Kaiser Pass. Other challenges have been with the weather. Last year, it was the snow and heavy rains that had washed out a portion of the Huntington Lake road. Thank goodness the road was repaired in time so we didn’t have to eliminate Big Creek from the ride. We plan to use a lot of signage to make the motorists aware of our Bicycling event so that our riders will be safe. This year, the fireworks at Shaver mean the ride had to be moved to July 7th. We appreciate your understanding in this matter. Mark your calendar for July 28th, 2018: the Annual FCC Tour De Lakes ride. This ride has two basic starting points 1) the Dinky Creek Road/Shaver Lake Park and Ride, or 2) the parking area at the Dinky Creek Bridge on McKinley Grove road. It is an out and back ride and you can go as far out and back as you like. Some go to Wishon Dam and some go to Courtwright Dam and back. Reminder to all our ride leaders, whether you are in the Killer Bees, the FACT, the Shop rides, or our many Club leaders: be sure to list your rides in at least one (if not more) of the Club venues, such as the Website Ride Calendar (see www.fresnocycling.com) and the Facebook pages. This insures that your rides will be covered by the Club’s insurance both for injuries to riders, and for liability coverage for you and the Club. That’s it for now. Look forward to seeing you on the Road! Greetings Fresno Cycling Club members and fellow bicyclists. What does that mean for us as members of the Fresno Cycling Community? It means it’s time to get out as often as possible and ride your bike! May has been declared National Bike Month for the purpose of focusing on the benefits of bicycling. It is a time for Advocacy groups such as the Fresno County Bicycle Coalition (FCBC) and the Fresno Cycling Club (FCC), along with all the area bicyclists and want-to-be bicyclists to get out and actively promote bicycling. As the Fresno Cycling Club President, my desire is to fill our Club ride calendar with as many rides, activities and events as we can think of to get people out on their bicycles. We will be partnering with the FCBC to make that happen. Central Valley Bike Month is a campaign that takes place in Fresno, Merced, Madera, Tulare, and Kings Counties each year. The focus of the campaign is to promote bicycle use as a mode of transportation whether for running errands, commuting, riding recreationally, or working. We encourage people to get out of their cars and on their bikes year-round, but we make it a big deal every May so that as more people become energized and comfortable on their bicycles they will be more likely to replace a car trip with a bicycle trip year-round. Fewer cars on the road improves air quality and reduces traffic congestion; and as more bike trips replace car trips, we expect to see a greater demand for investment in bicycling infrastructure and facilities. 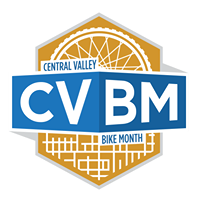 Record your miles at: http://cvbikemonth.com/. Get your team together and challenge others to see how many miles you can ride this month. There is a very busy Ride Calendar This Month. Keep an eye on the FCC Ride Calendar on the FCC website, fresnocycling.com for the latest updates on all things bicycling coming this month. May 2nd - The 18th Annual Mall-to-Mall Ride. FCBC's annual celebration of cycling. This event promotes cycling as an active means of transportation. All of these locations will join together at Manchester Center @ 08:00am, and then ride Downtown with all of the other riders. May 2nd 6:30 pm Regal Theater at Manchester Center. FCC Members Movie Night. Purchase tickets at: https://tickets.demand.film/event/4253. All of these events are in addition to the normal rides we have each month! Lately, there has been an alarming increase in the number of vehicles harassing bicyclists in our area. The worst has been an all-out assault on a bicyclist who was attacked by three assailants along Friant Road. They left him for dead and stole his bicycle and valuables. The bicyclist was severely injured with a broken arm and eye socket. The suspects are still at large. It makes one take stock of the safety of riding alone. These are reasons why the Fresno Cycling Club advocates for riding with partners and in small groups. You have better protection in numbers. Whenever you have an incident of harassment or a near collision, don’t hesitate to report it to CHP or the local police. If at all possible, get a description of the vehicle, the driver and a license number. If you have a video, that is great evidence that law enforcement can use. Even if you don’t have a lot of details please report it. A lot of these perpetrators are repeat offenders, and they will eventually get caught. Hope to see you at the Kirch Flat Ride. Greetings fellow bicycling friends and members! Spring has sprung, and the bicycling is at its best. Nice mild temperatures, clear skies and longer daylight hours to ride. Plenty of great places to ride and lots of great ride leaders to fill the calendar with rides of all levels! For all you fair weather riders out there, now is your time to ride. With the longer hours we have started up the “A” Train Rides again. This year it has been suggested that we provide a longer distance “A” ride for those who are transitioning from an A rider to a B rider. These are things we can do providing we get some interested Ride Leaders. If you’re interested in leading an “A” ride, contact either Devin Bovee (A/B Ride Coordinator) or Joseph Cassinerio (Killer B Ride Director). I would like to see the Club provide “A” level rides for beginners and those riders who want to ease back into riding after having been off the bike for a while. “A” rides are best if they are conducted in areas with available Bike Lanes and/or Trails. Mark and Michelle Locatelli also are providing leadership on the Social Train rides, which are longer “A”/“B” rides. Check the online Ride Calendar for our “A” Ride schedule. The Killer Bees, led by Director Joe will be providing training for Club Members who are new to bicycling. This will occur in some of the “A” Train rides. We’ve generally relied on Ride Leaders to give pointers to the newbies when they can. With more structure, the focus of these rides will be on training. We hope to provide a better learning experience for our new riders. Check the Ride Calendar for scheduled rides. The success of any Club depends largely on the effectiveness of their communications with their members. Our Club has relied heavily on the monthly Rough Draft Newsletter, monthly member’s meetings and email to communicate Club activities. With advances in technology, we now have more methods available to us. Those who are more technologically inclined have discovered that it is much easier to stay informed with the use of such platforms as Facebook, Facebook Messenger, Instagram, and the new FCC website with its “live” daily ride/event calendar. The members of the Board have been discussing how we can determine our most effective methods of communication. We have found that the use of emails and the monthly newsletter are not as effective as they once were. Available statistics indicate that a small number of members open emails from the Club and fewer yet open the Rough Draft link. We are realizing that we are able to communicate faster and get feedback with the use of Facebook and Facebook Messenger. We understand that not everyone is on Facebook and so it is important to learn what meets the needs of all our members. That said, we want to hear from our members, to determine what is the best way to communicate Club information. In the next few weeks, we will be sending out a survey as to your preferences. Please respond and let us know your preferences. With the riding season getting into full swing, we want to make sure everyone has the ability to get involved and stay informed. March was the last month for the structured monthly member’s meetings (which have been held every second Wednesday of the month). It was decided by a vote of the Board that the monthly meetings are no longer effective at getting members together to meet and have presentations or discussions. The monthly meetings have dwindled down to the same group of 20 to 30 members pretty much every month. After a discussion at the Board Meeting, it was determined that the Club should try other methods to reach out to members and bring them together. So, we will be trying some different methods in the next few months to see what works the best. Some of the things discussed were coffee shop meet-ups (either by bike or not), movie nights, as well are various ride opportunities that can provide connection. If anyone has an idea, please share with any of the Board members. That’s about it for now. See you on the road! Tracy, in addition to many of our own Club members. In the third year of doing the Brevets, these rides have become a popular event. Remember, the Raymond 200K is just the first of six Brevets in the series. You can find links to the remaining Brevets at our website https://fresnocycling.com/FCC-Brevet-Series. Once again, Ride Director Lori Cherry has shown that there are many folks who love challenging long rides. Thank you, Lori for your passion for great bicycling events and riding opportunities. The Fresno Cycling Club has a reputation for putting on quality bicycling events. Our oldest event, the Climb to Kaiser (now in its 42nd edition), has been a popular event, designated by Bicycling Magazine as one of the Top 10 most challenging rides. Also, Granfondo.com has designated it one of the Top 10 Best Rides in America. C2K planning and preparations are already underway. If you’d like to help with the planning, contact me at kaiser@fresnocycling.com. Our next oldest ride is the Bass Lake Powerhouse Double Century. This past year, our very own FACT (Filipino America Cycling Team) group lead by Angelo Quitorio (in his first year as a Ride Director) put on a very successful ride. The Bass Lake DC has been directed over the years by Past President Ron Quitoriano, Richard Hoff, and more recently, Tom and Elisabeth Guevara. The Bass Lake DC is one of the more challenging “doubles” in the state-wide Triple Crown Series of Double Centuries, and has been praised as one of the best supported rides. Check it out at http://www.basslakedouble.com/. The Kirch Flat Century is another great ride staple of FCC. For years, it was a members-only event. Over the past few years, the Kirch Flat ride has been expanded to be a full-blown event. It is now a paid event open to the public. This year, it will be the Kirch Flat Cinco de Mayo Century, and actually be on May 5th!! Ride Directors Yvonne Moreno and Michael Quiroz are promising a great ride for all. Register on the Websiteat https://fresnocycling.com/Kirch-Flat-Cinco-De-Mayo-Century-and-Rides. A new ride for FCC this year will be the Grizzly Century. Yes, FCC will be working with the great folks of North Fork to revive this popular ride. This ride has been a favorite of many bicyclists from all over the state for many years. It has also been the main fund-raiser for the North Fork Scenic Byway and North Fork Community. Due to health issues, their rideleader has had to step down, and they have asked the Fresno Cycling Club to help bring the ride back. This will be the 25th edition of the Grizzly Century. It is slated to occur on October 6th, 2018. We are excited to bring this rideback after it missed a couple of years. Registration will be up soon on our website. 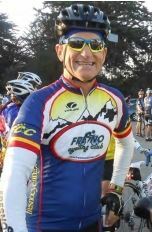 Please check out the FCC website www.fresnocycling.com for the latest Ride Calendar. This gives a more accurate picture of upcoming rides, as it's updated constantly. Please also check the Facebook pages for the various "subgroups" (FACT, Killer Bees, All-Roads, etc.) if you want to catch any of their rides. (Links to their Facebook pages are on the FCC website). Dennis will be working with the Killer Bee group to develop a program to provide bicycling orientation and training for newer riders. We will be putting together a group of ride leaders/trainers whose focus will be on new rider development and rider skills improvement. We will provide training level rides within the “A” and “B” categories. All new riders will be directed toward the FCC Killer Bee’s ride group for orientation and beginner training. The Killer Bee group has been an active FCC group over the past 4 to 5 years. Their focus has been on putting on B level rides, and training those members to do more challenging rides. Taking on this new role will be a great fit for the Killer Bees. You can contact the Killer Bees at killerbees@fresnocycling.com, or their Facebook page. 3) they help promote the club and attract new members. The rides that require a lot of volunteers are those that have multiple rest stops, SAG support, and logistic requirements. These are rides such as Kirch Flat Century, Climb to Kaiser, Grizzly Century, Bass Lake Double Century and the new Gravel ride. Other events such as the Time Trial Series and Tour de Lakes can typically be handled with fewer volunteers. FCC Event/Volunteer Coordinator Patricia Dailey would love for you to contact her as to which events you are able tohelp with. She can be reached at ‪volunteer@fresnocycling.com. There are a few positions that the club could use help with. 1) Grizzly Century Ride Director - duties would include a position on the Board of Directors, assisting the President with the planning and coordination of the GrizzlyCentury. 2) Quarter Master Position - duties include the management of the Club's equipment and storage units, distributing equipment to Ride Directors as needed, and working with the Board to keep our equipment and supplies up to date and serviceable. We just completed the latest Voler jersey order. Thanks again to Diana Dean for your help. The Voler Online Club order will be shipping out toward the end of March: just in time for all of the upcoming riding events. If you missed out on the order, there were a limited number of items ordered as extras. Also, future orders only have to meet a 5-item minimum with the Voler Online Club. Show your pride in Fresno Cycling Club by wearing your Club jerseys often (especially at events away from Fresno). Always remember (whether wearing your Club jerseys or not) we are ambassadors for safe and legal bicycling, and want to set a good example for all bicyclists to follow. We can’t always be perfect, but we can always try to set a good example, especially in the areas that cause interaction with motorists. Some of these interactions include stopping for traffic controls when other vehicles are present, not riding two or three abreast, being mindful of traffic and moving to the right to allow for safe passing, and always look for motor vehicles before dropping back in a pace line. By demonstrating courtesy while riding, we can generate a more favorable opinion toward us by motorists, thus fostering a safer riding environment for everyone. That’s all I have for now! If you have any questions,comments or general feedback don’t hesitate to contact me at President@fresnocycling.com. Happy 56th Birthday, Fresno Cycling Club! FCC has been around for a long time: John F. Kennedy was the US President in 1962, and the Schwinn catalog had a full range of bicycles priced under $100. The Schwinn Super Continental sold for $107 and the Schwinn Paramount race bike sold for $175. Things have changed quite a bit over the years. Now instead of 10 speeds, we have 22 or more. Instead of steel frames, we have carbon fiber frames and carbon fiber wheels. In fact, you can now have just about everything carbon fiber on the bike (except the tires). Instead of a $175 race bike we now have $12,000 race bikes. But after 56 years and many changes, riding a bicycle is pretty much the same. We still ride for fun, for exercise and for a challenge. The Fresno Cycling Club has its roots as a racing team, but over the years has morphed into the Central Valley’s largest recreational cycling club. Our mission today is to promote safe, legal cycling through our many cycling rides and cycling events. Our member ride leaders and event volunteers make this all come together every year. Our dedicated Board members help lead the Club and carry out the mission. The Brevet Series will kick off this year with the Raymond 200K Brevet on Feb 24th, the first of 6 brevets that are scheduled. The other 5 are listed on the Club’s Website. The Belmont - Academy Time Trial Series starts Tuesday March 20. These TT’s are free to members and $5.00 for non-members. The Annual FACT Ride in April. The Kirch Flat Century (Cinco de Mayo Century) will occur on May 5th this year. Registration will open soon. The 42nd Annual Climb to Kaiser will occur on June 30th this year. Registration is open now. Register now to take advantage of the discounted rate of $95. The Tour de Lakes will occur on July 28th. The Grizzly Century (probable date Sept 29th). The Bass Lake Double Century will occur on Oct 13th. The Raymond Gravel Grinder (date to be determined). In addition to all of these great rides and events, our ride groups are posting all levels of rides on the Club website calendar as well as on our Facebook pages. Remember we are all Advocates for safe bicycling by how we ride. Be courteous and be friendly: it goes a long way to give our sport a positive image. Ride safe and Ride legal. Greetings Club members and Happy New Year! Are you as excited about 2018 as I am? I hope so. I am looking forward to all the exciting bicycling that we’ll have in 2018. Not only do we have some great events planned, but we are gaining more ride leaders to fill our daily ride calendar with lots of rides. More rides mean more miles! Many of our members posted some very impressive mileage numbers for 2017, and with more members coming on board, I can see those numbers getting even more impressive. With the increasing popularity of cycling, we have experienced a significant increase in our Club’s membership over the past few years. With a Club membership approaching 1,000, it is impossible to get everyone out at once. I suppose a reason for this is that as bicyclists we tend to ride in small groups with friends and bicyclists we feel comfortable with. It is nice to be able to ride with a group with similar abilities and riding styles. We’ve found that when we do put on Club rides, usually only 75-100 or so show up and even on one our largest rides (the New Year’s Day ride, or the Tour de Lakes) we might see a little over 100 riders come out. While we’d like all members to come out for these larger Club rides, we really appreciate all of the smaller ride groups that have stepped up to meet the needs of the Club members! Greetings fellow bicyclists and Cycling Club members. When your passion is bicycling, you can’t find a better place in California to live than the Central Valley. No matter what type of bicycle you ride, there are areas to satisfy. Every mode of bike travel, from trails around town, to the country and foothills, and roadways everywhere. Some with fun routes into the nearby foothills and some with challenging climbs in the mountains, often with bike lanes or nice shoulders. Couple the superb areas to ride with some beautiful weather and you have a winning combination to satisfy many passionate bicyclists. Being centrally located also makes it rather easy to access other great riding areas on the coast and bay areas. Talking about beautiful weather, this November allowed for some great bicycling. Ride leader Ken Herrington took a group on his annual American River Parkway ride, reporting back about having a fabulous time. Lori Cherry put together another great ride in the Brevet Series, Henry Pretzer lead another All-Roads Ride, Ann Heiniger lead a great foothill ride, the Killer Bees led by Joseph Cassinerio had some great rides, as well as all of our other ride leaders. Thanks to all of our stalwart ride leaders who continue to bless the Club members with many ride opportunities and options. Over 6 years ago I was asked by then Club President Ron Quitoriano if I would serve as the Club’s Vice President as then-VP Don Warner was stepping down. His pitch was that it was an "easy position" and that all I had to do was to put together the Annual Christmas Party. I thought that seemed easy enough, why not? I had just retired from the Fresno Police Department and figured I would have plenty of time to put together this one event. Little did I know that Ron’s plan was to retire that next year after having served for over 4 years. He also hadn’t told me that the VP position was automatically next in line for President. Well, it has been 5 years as President for FCC. I have a great group serving as our Board of Directors, which makes my job as President easier. I have to say I have enjoyed serving as the Prez and look forward to at least another year at the helm. Looking back on 2017, I can say it has been a fantastic year of bicycling for our club members. It would be interesting to tally up the total miles ridden this year by all of our members. There have been so many great accomplishments this year, the many metric, century, and double century rides. The numerous bike tours both guided and solo. The Silver State 508 raceby several of our members. The out of country rides covering countless miles. And the many local, daily, weekly and monthly rides of the FCC ride calendar. Not to mention all of the miles of racing by many members. I suppose it could be done if everyone would list their total miles for the year on the website. We will work on that. Start tallying your miles. Well it is that time of year again, time to exercise our Corporation’s responsibility of nominating and electing our Club Board members. The nominations occurred during October and have closed. The ballot is set and the election will occur this month. We will be conducting an all-electronic election via email. Watch your email in the next week or so for your ballot. The 2017 Bass Lake Powerhouse Double Century is a wrap. This year’s event was orchestrated by the FCC FACT (Filipino American Cycling Team) lead by Ride Director Angelo Quitorio and his assistant Steve Maquiso. For years the FACT have been assisting with the BLPDC putting on a fabulous rest stop at the Millerton Store. This year Angelo volunteered to take on the Directorship and he did a fabulous job. New features of this year’s event were using the Hampton Inn as the event venue and reversing the route direction. Both of which were well received and praised by the riders. Many riders commented that this is one of the best if not the best supported Double Century ride, with lots of SAG support, radio support and well stocked Rest Stops. Kudos to Angelo and all our great volunteers who made this event successful. This year the Fresno Cycling Club is proud to be a part of the First Annual Veterans Appreciation Ride put on by the Club’s own Killer Bees and FACT. The ride is a charity ride to benefit the HONOR FLIGHTS provided to Central Valley Veterans. The ride will be held on Friday Nov 10, 2017. The cost is $25 to ride or you can donate if you can’t ride. The registration link is on the FCC website. This ride is open to all members and friends of the Club. It will be an all level ride from the Clovis Hills Church at Willow - International to Friant and back (15.5 miles) or beyond for those wanting more miles. This event is from 8:30 am to 11:30 am. The ride will be followed by a breakfast served at the church. All veterans and their friends and families are encouraged to attend. Veterans ride for free unless they chose to contribute to help the cause. On Saturday November 11th, 2017 the Fresno Cycling Club has been invited to be participants in this year’s annual Veterans Day Parade. Please wear your Fresno Cycling Club jersey or kit, FACT kit or Killer Bee jersey or Kit. Ride the bike of your choice capable of completing the parade route about a mile and a half. Watch Facebook, our website or your email for additional details as they are available. For most bicyclists the cycling season is coming to a close as many cyclists are fair weather and warmer weather bicyclists. It has been a great year for bicycling, we have enjoyed many great cycling events this year here on our own turf. Starting off with the Annual New Year’s day ride, the Brevet series, the Time Trial Series, the Blossom Trail ride, the California Classic, Kirch Flat, Hungry Buzzard Century, Climb to Kaiser, Tour de Lakes, the Goathead Century, the Tandem/Recumbent Rally, Tour de Fresno, and the Bass Lake Powerhouse Double Century. Thanks to all our great ride leaders we were able to enjoy a lot of daily, weekly and monthly club rides. This year also saw the addition of some great gravel grinder rides lead by Henry Pretzer and others. Now for those of us that ride all year be sure to check out all the rides on this month’s ride calendar. There will be the Veteran’s Ride, the American River Ride, a Turkey Day ride, a gravel grinder and a Time Trial up the Four lane. So get your cold weather gear out and keep on riding. When you at least keep a base conditioning it makes it so much easier to get into longer riding next season. We have been pondering this for some time now. Effective Jan 1, 2018 there will be no printed version of the Rough Draft available in the Bike Shops or mailed to the few members that had been paying for it. No we aren’t stopping the Rough Draft, it will continue on but it will be available through email and on the Website. There are so few people that actually utilize the printed version that is no longer beneficial to produce. Also the main reason those who got it was for the ride calendar. Now that the ride calendar is on the website as a “living” document the printed version is no longer as user friendly as it doesn’t account for last minute changes to the calendar. Also we may be moving to an online BLOG format which would allow for greater input by all members who wish to participate. You will continue to receive the Rough Draft via email delivery. I encourage all our members to be a part of the planning process for next year’s rides. If you have a ride that you love to do, remember that others may love it too. Get it on the ride calendar or share it with our ride coordinators, Nancy and Henry and they may have someone willing to lead it if you’re not comfortable leading it. We will be starting off 2018 with the Annual New Year’s Day Ride, in honor of our very own Diana Herrington, who left us too soon, this year’s ride will be the “Diana Herrington New Year’s Day Muffin Ride”. We may be adding a couple of riding events this year. There is interest in bringing back the Bass Lake Century also known as the Big Hat Century, and the Club has been asked to coordinate the Grizzly Century for 2018. We will be looking for Ride Directors to take on these events. If you are interested or know someone who may be interested, please contact myself or a Board member. I hope you all are enjoying using the new FCC Website. Our Webmaster William Ewy has done a great job of getting it up and running in the new format. We can now handle all our club business on the website. Our memberships, new and renewals are all handled at the FCC website, you can even indicate that you want auto-renewal which takes the guess work out of keeping your dues current. We can conduct all our event registrations on the website which makes it easy for members when they login the registration gets populated with all their information, making the registration process a breeze. This also does away with the event fees saving our members and event participants money. We are barely scratching the surface as to the capabilities of this new site, so we look forward to making other aspects of the site available in the future. Do you want to take a shot at doing a Double Century (200 miles)? There is one just about every weekend of the year now so there are plenty to choose from. There seems to be a large group of FCC members that are committing to take on the Triple Crown and/or the 1000 Mile challenges for 2018. Watch the ride calendar for training rides and the Facebook FCC Double Century Group for more information. FCC has some legends in the Double Century category, Richard Hoff 150 Doubles, Roehl Caragao 100 Doubles, Ron Quitoriano nearly 100 Doubles, as well as many other FCC and FACT members who have done numerous Doubles. So if you’re interested then contact myself or other Board Members for additional information about the FCC Doubles Gang for 2018. That’s all for this month. Hope to see you on the road.